There are various ways you can work to help keep your body relaxed and healthy. One interesting way you can do so is with infrared saunas. Infrared saunas work to help detox your body with heat and lights so it feels more energetic and becomes free from harmful toxins. If you’re interested in learning more about infrared saunas, you’ve come to the right place. This article will explore more behind these devices and some of the top picks you can use. What is a Portable Infrared Sauna? A portable infrared sauna is a medium-size device that is meant to allow you to transport it around with you wherever you’d like to use it. It works the same way as a non-portable infrared sauna, but is more compact and much less expensive. The sauna works to emit heat and lights that get quickly to work trying to detox your body from harmful particles. Portable infrared saunas work in a unique way. These portable items can be unfolded and opened so you can sit in it. It has a small hole at the top of it where you can stick your head out when using the sauna. You can turn the sauna on so that it starts working to emit infrared lighting and heat to help encourage your body to sweat which will help to remove toxins from it. Are Portable Infrared Saunas Safe to Use? At first glance, a portable infrared sauna might look a little daunting to use. Is it safe to sit inside the sauna? Is all of the infrared beams hitting my skin ok for it? The answer to these questions is yes. It is completely safe to sit in the sauna, although at first it might take some getting used to. It is important though to always stay alert when in it so that it doesn’t overheat your body. As for the infrared beams, they are safe as they work the same way as the sun does to help nourish skin, but without the harmful UV rays. It is a good idea though to check the EMF (Electro Magnetic-Fields) to ensure that the beams are emitting too much of the beams which could cause irritation. However, this is often very rare that a portable sauna does this, so there’s no need to worry about them all being harmful. How Many Times Can I Use the Infrared Sauna? You can use the infrared sauna as much as you want! Most people tend to have 3-5 sessions per week which last anywhere from 30 minutes to an hour. However, while there’s really no limit to the amount you can use it, it’s a good idea to not overdo it. If your body can’t handle many sessions only do a few per week. The more you use it though, the more results you’ll see. Many people often wonder what the benefit of using a portable sauna is when compared to a traditional stream and non-portable one. Unlike regular non-portable saunas which can cost thousands of dollars, portable infrared saunas are extremely affordable. You can easily invest in one without worries of overspending. These devices get to work quickly which is ideal for many people. As soon as you turn the device on, you’ll instantly start to feel the heat warming your body to encourage sweating and increased blood circulation. Because of this, you can get a quick session in without having to wait a long time before it works. This is unlike steam saunas which take up to 30 minutes before they’re fully ready to use. A great thing about these products is that they come in different styles. This is good as you’ll be able to find one that fits your preferences and style. You’ll find everything from light brown to sleek silver designs. One helpful thing about these products is that they are compact. They can often be folded up and packed away so they don’t take up much space when in storage. They also don’t take much space when open so you can easily use it in a room without it blocking things. Our bodies are constantly coming into contact with toxins daily. Thanks to portable infrared saunas though, they help to encourage your body to sweat which ends up releasing any toxins inside you. This can end up leading to you feeling more energetic and healthy because you don’t have heavy toxins weighing you down. While they work similarly to steam saunas, they don’t require you to have to sit in large space in order for it to work well. They also use dry heat which is a little better for your skin rather than steam saunas which create moisture. Before you buy a portable infrared sauna, there are a few important things you need to consider. Below you’ll find some crucial things to keep in mind before investing in one. While compact, it is a good idea to consider the size of one of these products. They each have their own dimensions so it’s important that make sure that you invest in one that will fit the space you plan to use it in perfectly. You’ll also want to consider your height. Portable infrared saunas can be a little low or high for some people. You should pay close attention to the dimensions as well for this to make sure you can sit comfortably in it without problems. These saunas can get to be very hot, so it’s a good idea to look for safety features built into them. Ideally, the sauna should shut off after a certain time amount to help keep it cool and prevent it from causing problems for your body. You’ll want to look for this shut-off feature to help ensure that you can safely sit inside it without getting too hot. 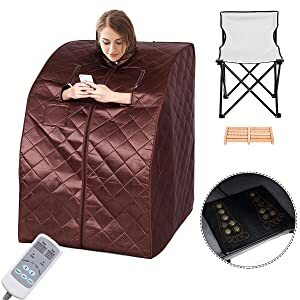 Many of these infrared portable saunas require you to sit on something while you’re inside it. Most saunas usually include a fold-up sauna chair you can use, but not all. You’ll want to check to see if the model you’re interested in comes with one. Otherwise, you might need to invest in an infrared-friendly sauna chair yourself. A foot pad is a useful tool to have as it’s designed to work on your feet and clearing them of toxins while the rest of the sauna works on other parts of your body. The foot pads that tend to come with these devices have special pads on them which emit infrared rays to your feet so they aren’t missed during your session. If this seems like something that you believe can help you, definitely be sure to check to see if the model you’re considering investing in has one. While these saunas usually fully heat up within a few minutes sometimes it can take a little longer for some models. Ideally, it shouldn’t take longer than five minutes for the device to fully heat itself up. Longer times can make it more difficult to enjoy the session as you’ll have to wait a bit before it fully starts working. Because of this, be sure to check how long it takes for the sauna to fully heat up. 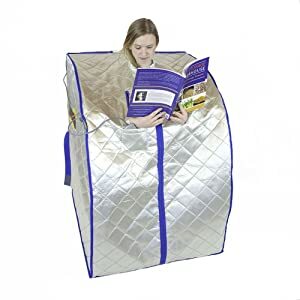 This large silver and blue portable far infrared sauna by Health and Med features four EMF-safe heating panels inside it that can go up to temperatures of 104-140oF. These panels work to emit low EMF levels to encourage your body to sweat toxins out. You’ll also find an infrared foot pad on the bottom to help aid with this process. It measures 41 inches tall, so it works perfectly for people of all heights. You can enter this infrared sauna by unzipping the front zipper and place chair inside it you can sit on while receiving your treatment. You’ll find a plug in the back of it you can use to plug it in so it can get to work emitting heat. The sauna comes with a timer that features over five different temperature controls so you can adjust things according to your needs. Once you’re done, you can turn the heater off and fold the sauna together until you need to use it again. This model is a little on the pricey side, so if you’re looking for a model to just try out this might not be the best choice for you. The SereneLife Portable Infrared Sauna is an affordable model that features a black exterior lined with blue trim. This EMT-safe infrared sauna is easy to move around and comes with a temperature adjuster you can use to ensure things don’t get too hot for you when you sit in it. The heater is situated in the back and can be turned on with the plug it is attached to. It can run for up to an hour before it shuts itself off for safety reasons. The sauna can go up to a temperature of 140oF and comes with a cushioned foot pad you can rest your feet on. 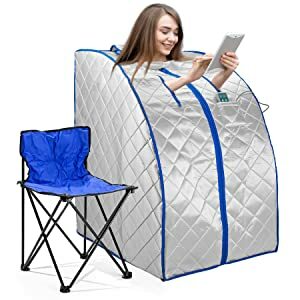 In addition to this, the sauna also comes with a sauna chair you can sit on when using this portable sauna. It’s 28 inches high and uses 120V in order to run. 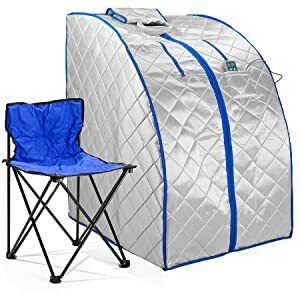 This portable infrared sauna by Radiant Saunas features a gray double-padded exterior which works to help keep the heat inside it as well as make it more comfortable for you to sit in it. It comes with compartment zippers on the front which you can open so you can use your phone or read while sitting in it. The sauna includes 3 ETL EMF-safe carbon fiber panels that work to help encourage your body to sweat. It has a built-in timer that has over six different options you can use as well as five different temperature settings. The sauna can go up to 150oF and has a 6.5 ft. power cord so you can move this sauna around to various areas without problems. 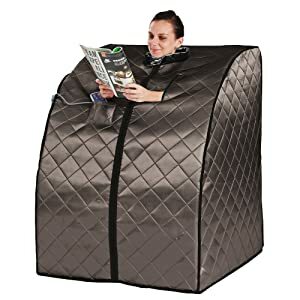 It comes with a comfortable neck collar to help support your neck when you sit in it as well as canvas seating inside you can sit on when using this sauna. It also features two pockets on the exterior so you can keep things close at hand when you’re using the sauna. The Giantex Portable Sauna is made with a sleek light brown design. It features a neck opening where you can put your head when you sit in it, as well as two hand openings so you can keep yourself occupied when in it. It has a comfortable foot pad inside it, which includes three different heating levels, where you can rest your feet so they can also receive treatment. This far infrared portable sauna uses EMT-safe infrared rays, tourmaline, and mica to help better give your body a better session. The sauna can go up to temperatures of 60-140oF and has a timer that can be set for up to one hour. Once that time has passed, this sauna will automatically shut itself off to help prevent overheating. In addition to this, the sauna comes with a folding chair that you can sit on when enjoying the infrared heat from it. When you’re done using the sauna, you can turn it off and fold it up until you need it later. This product is affordable making it perfect for those on budget and is lightweight so it won’t be difficult to transport around. This infrared portable sauna by Idealsauna comes in a stylish silver and blue design. It is created to quickly heat up, less than five minutes with its ION infrared rays, so you don’t have to spend much time waiting for it to do so. The timer connected to it can be set for up to 30 minutes and uses 110V to run. The three heaters inside the sauna are made to be efficient so they’ll work to quickly help your body remove toxins without overheating. You can turn the sauna on with the power cord built into the back and can turn the heater off with the timer built into the sauna that’s easily accessible from where you’re sitting. The sauna comes with a heated foot pad and sauna chair. 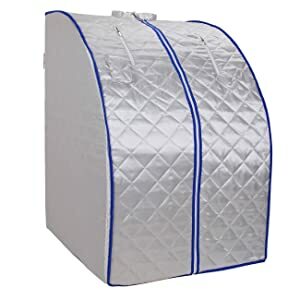 This Durasage Far Infrared Sauna features a silver design with blue trim and comes in an extra-large size so you have plenty of room to move around in it. The sauna only takes about five minutes to completely heat up and its interior has a few infrared panels which will work to help clear your body from toxins so you can feel more energetic. It comes with a built-in timer that can be set for any time up to an hour and a remote that can be set up to a temperature of 150oF. This model also comes with a sauna chair you can use to sit on when you’re inside the infrared sauna. You’ll also find a pocket on the outside of the sauna which you can use to put your devices or other items in when you’re using it. This product also comes with a heated foot pad you can place inside it so your feet can also have a full infrared treatment. The Ridgeyard Portable Infrared Sauna uses FIR infrared rays to help cleanse your body from harmful toxins. It is EMT-safe and comes in a silver and blue design. It features a neck opening at the top with padding so it doesn’t rub uncomfortably against your skin. There are also hand openings you can use so you can handle your devices or read while you’re sitting in the sauna. The sauna works quickly at heating up, it only takes five minutes, and can go up to a high temperature of 140oF. You can turn this device on with the power plug in the back and activate the timer and temperature control with its built-in remote. It has a safety feature built into it where it will automatically shut itself off after 40 minutes to help prevent overheating. The sauna comes with a foot heating pad and sauna chair and runs on 110V. Portable infrared saunas are extremely helpful devices that can help to detox your body instantly. They work just as well as more expensive sauna types and are affordable. 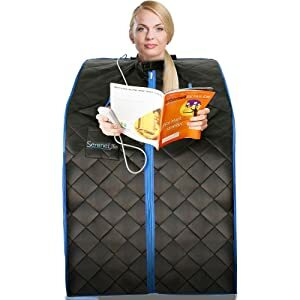 If you’re looking to invest in a portable infrared sauna to help keep your body healthy, definitely consider using one of the infrared sauna products mentioned above.